Cast Includes: Alistair Barron, Kieran Brown, Greg Castiglioni, Lewis Cornay, Alexander Evans, Simon Green, Emma Harrold, Devon-Elise Johnson, Claire Machin, Oliver Marshall, Matthew McDonald, Chris McGuigan, Matthew McKenna, Gemma McMeel, Janet Mooney, Joel Parnis, Timothy Quinlan, Philip Rham, Dudley Rogers, Victoria Serra, Niall Sheehy, Judith Street, Stephen Webb, Samuel J Weir. Liverpool is shaken by a breath-taking and emotional tribute to the real events that took place on the maiden voyage of the RMS Titanic in April 1912, adding a musical twist which adds further layers to the tragic events. This brilliant production direct from London won sweeping critical acclaim across the board. The show begins with a lone man placed on the stage as the audience enters, writing in his journal (assumedly the events that are about to take place). When the lights dim, members of the cast enter from the stalls with the musical numbers bellowing across the audience in full swing and taking viewers straight into the action. Do not expect Celine Dion to appear in the score, however. Instead Maury Yeston provides a beautiful and poignant soundtrack which triggers goose bumps and watery eyes from the get-go. Every cast member has a voice which is powerful, mesmerising and unfaltering throughout. With an array of storylines, it is initially difficult to keep up but the diverse class divisions, but each of the memorable characters all become three-dimensional as the audience awaits their impending doom with trepidation. As the boat approaches the iceberg, the tension exudes within the room causing shakes, jumps and an explosion of light as the first half dramatically ends. The meaty action of the show becomes fast-paced when entering the second half as the characters try to rush for safety. Bring tissues and prepare for tears as the second act takes the audience on a spiral of heart-breaking scenes. The setting is beautifully and simplistically laid out as a ship, with the production relying on the lighting, props and the actors to distinguish scene changes, which they achieve impeccably. The real scene stealer is the moment Thomas Andrews (Greg Castiglioni) holds onto the ship he designed before falling to his death. The ship impressively lifts off the stage and rises, creating an intense and heart-racing unforgettable moment. A trio of blame completely steal the show. 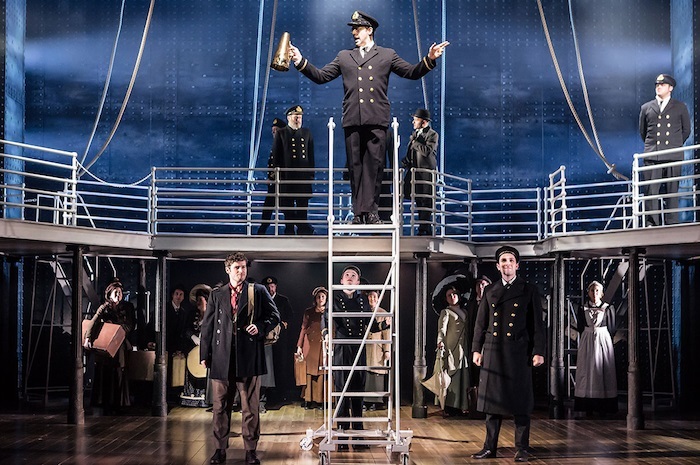 Greg Castiglioni as the designer Thomas Andrews, Phillip Rham as Captain Edward Smith and Simon Green as the owner J. Bruce Ismay of the White Star Line. With all three portraying raw emotion and heartache, making it impossible to take your eyes away. Special mention to Lewis Cornay as Wallace Hartley/Bellboy, causing tear-jerking moments with his moving vocals. The show ends with a touching memorial of historical facts including a picture of the names of each person who did not make it off the ship. With a well-deserved standing ovation, this show might just be unsinkable. Titanic The Musical is at The Liverpool Empire until August 4th.